What happened to the 2nd Klaine kiss? Glee returns for a new episode in the US next month and continues in the UK on Mondays at 9pm on E4. 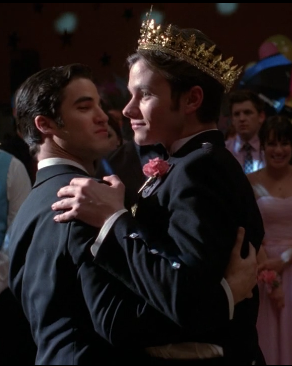 via Chris Colfer unsure about ‘Glee’ prom – Glee News – US TV – Digital Spy. This is a news item from back in March, before they filmed the season finale, so it appears that the kiss was cut. I wonder where it was supposed to happen. Ideas? I thought the general consensus was that he meant the Kurt/Blaine was better than the kiss with Karofsky and that article cited a previous interview and got everything bizarrely out of context. Oooh I wasn’t aware of this. Must go see can I find the interview.